This weekend we had a pretty exciting development at our house! Remember our wood floor project I mentioned awhile back? Well, on Saturday the yucky old carpet was finally removed from our upstairs hall, our master bedroom, the staircase, the living room and the dining room. YAHOO! Progress. It is funny how simply getting rid of things you dislike in your house makes things feel better, even before the pretty new stuff goes in. I’m GIDDY, I can hardly believe this is my house! First my kitchen was torn out, and now my floors! Basically my whole house is a happy mess right now. Am I dreaming? Don’t wake me up if I am. It was a long wait (we’ve been thinking of these changes for three and a half years) so it is especially exciting to finally be able to see our house starting to be transformed! We decided to spare ourselves the public humiliation time and hassle of a DIY project and have Lowe’s take care of our project from tear out to installation of our new pre-finished Hickory wood floors. The smart people at Lowe’s decided it would be good to use Kilz primer on the upstairs hall and master bedroom floors prior to installing the wood. That will to seal up any odors that may have absorbed into the subfloor due to unfortunate pet accidents. Eh hem. Good to know. Once I saw the white subfloor I almost called the whole wood floor project off. 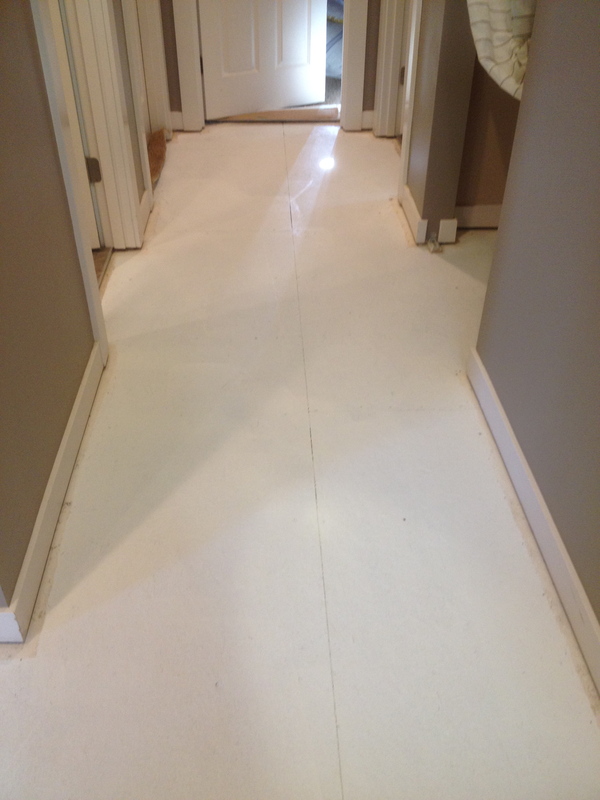 Painted white subfloors could look pretty cool! I may still do that in some of the bedrooms that still have carpet. I’m so glad we made the decision to do this flooring project with the help of Lowe’s! Even our most simple attempts at home improvement seem to take FOREVER to complete due to our crazy schedule, lack of DIY skill and often my own indecision. It will be amazing to see a project like this TOTALLY transform our house in a matter of DAYS! Update: Here is the Hickory flooring, it is solid wood pre-finished interlocking flooring. I did a little simulation for you with some of the planks! It is the same hardwood flooring we have in our kitchen and entry and I LOVE LOVE LOVE it. I’ll talk more about it after the installers come on Tuesday when I can show you more progress! Wow! it looks amazing already. Smart people getting someone in to do this daunting task for you. would have loved to see the floor you chose…we are pulling our carpets out in September…hubby doesnt want to be inside working on projects during the summer…I can’t wait…we’ve had this carpet for sixteen years, its time for it to go- will be watching for what’s next…we will be doing a DIY for our floors…cant afford to pay someone to do it…in the meantime I’m going to try and talk him into taking the wall down between the kitchen and spare bedroom and making that bigger..wish me luck!! Ok, I did a little simulation of the flooring with the planks and added in a pic! :-) I’ll talk about it more when it goes in! So happy for you!…new floors. I totally agree that sometimes it’s just best to have the pros do it. I’d get about halfway through and think, “why’d I start this? !” Lol! Ha, oh yes. We’ve done that quite a few times and it never ends well. HAAA! What a wonderful project to be doing. We have Hickory kitchen cabinets, so I know how Hickory looks. I will keep stopping by to enjoy the show. Wow, congrats!! 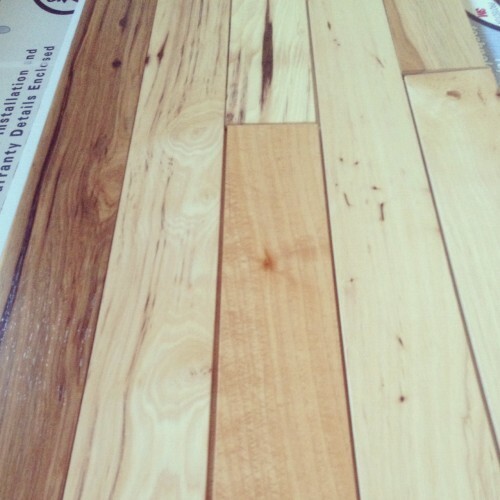 How wonderful it will be to have hardwood instead of carpeting, I’m very happy for you! Can’t wait to see the end result! Looking good!! Can’t wait to see the flooring installed. *There’s still time to enter the fabulous freebie from GoodBelly over at Her Split Ends! Look forward to seeing the finished project…i’m sure you are ready to have your house back! How exciting! Lucky you. Can’t wait to see pics when it’s all done. Thanks, and wow, yes. It is a great tip, I bet you were glad to move! Ew! exciting! I think it was a good idea to hire someone else to do the job, I’ve heard that flooring is one of the most difficult tasks. So exciting! Can’t wait to see the progress. And I agree with all your reasons for going with the professionals…same in this household too. 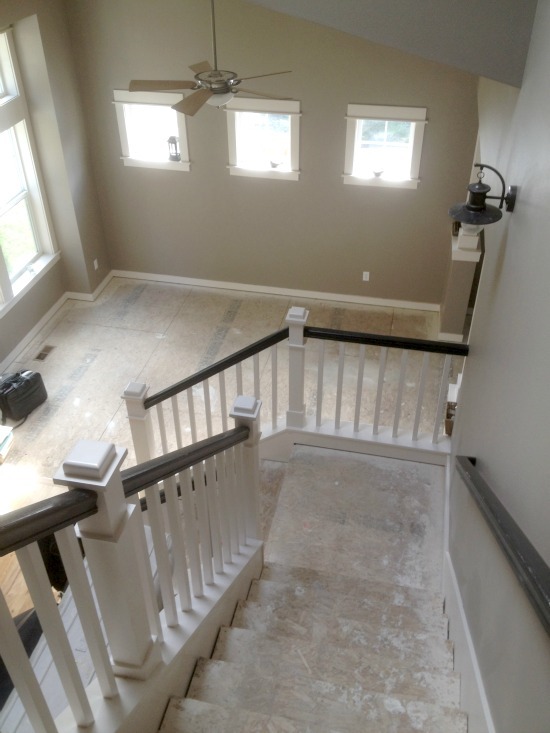 LOL Love your staircase…wood is going to make it look stunning! Thanks Lara, I’m super excited about the staircase! So happy for you! I’m saving my pennies right now for our new kitchen floors. Getting rid of this old 80’s linoleum will be like heaven. I’m so totally jealous! I am cursing my carpet (and carpeted stairs as well), and am dying to rip it all out!! I’m not there yet – so I will live vicariously through you for the moment. :-). It’s looking AWESOME! :-) I have been cursing mine forever, this day couldn’t get here fast enough. Thanks for being excited for me even though you are still waiting …. the wait will make it all the sweeter when the day comes! So worth the wait … I am happy for you, Melissa. I love following you and all you are doing! The funny thing is I decided to get new cabinets that became a major remake involving knocking out walls, taking up carpet and making a thousand decisions! We even moved a wall to have an upstairs laundry! I had to decide if I wanted a farm sink bad enough to pay that much about the same time you had the post on your sink. I picked hickory flooring like you too. Today the guys finished painting and I’m loving it! Only thing left to decide is the backsplash, so hope you will be discussing that soon! Very exciting! Did you guys have to move out? Any time that a project gets accomplished in a few days instead of months is fantastic. No wonder you’re giddy! And what a good tip about the Kilz! We recently had Lowe’s come out and measure our floors to get wood and tear up the nasty carpet…my hubby is dragging his (cheap) feet and now we had to have them come out and measure again because we let the timeframe expire. UGH. I am ready to rip that nastiness up! Your pictures gave me hope and motivation to bug him some more about getting on with it. :) Your home is going to feel so fresh and beautiful! That wood floor is going to be awesome! I am so jealous! Is the kilz primer a latex or oil? And how did they apply it? I have to do that in my rooms too, because of pet accidents. It already looks better. I know that feeling. You’re on a tear, it really is starting to look like a new home, congratulations. So nice. I don’t blame you for allowing someone else to do the install. My husband said the same thing, if we do wood floors, someone else will install it. I can’t wait to see everything completed. I love the excitement!! 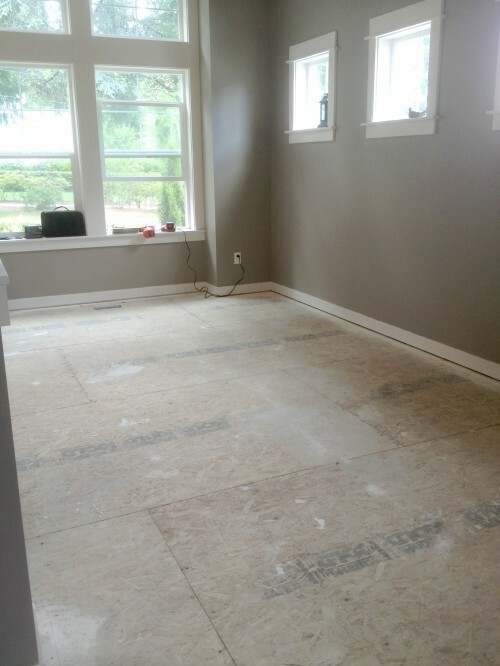 Seeing all the sub floor makes it seem like you’re starting from scratch…like a new build….just 3.5 years later! Haha! I’m so happy for you. The floors will be beautiful for sure. I hope that when it’s done you will share your tips for keeping up the floors. Maybe I’m lazy….but I don’t like taking the time to sweep, vacuum, and dust mop every other day. When we went from gorgeous pine floors in our forever home to carpet in the next house, I hated that I knew the carpet wasn’t as clean…but I loved not being a slave to the floors. We have 3 cats…2 of our own and now my mom’s cat, also. “Mr. Fluffy” (not his name – he prefers to remain anonymous in subject matters like this) has the biggest fluffiest paws ever….and he tracks litter every where. (I even put a rug on either side of the litter box…not that that is pretty, but what’s a girl to do?) Not to mention all the fur bunnies (kitties?) there are in a blink of an eye. Arrrgh!!! I need a floor maid!! Sorry for the blathering….I’m obviously having a floor issue in my life these days! Can’t wait to see it all coming together!! I’m impressed. You were “super floor woman” in your old house. I’m actually on the look out for a wide angled broom with very soft furry ends. I had one once (actually my dad gave it to me for a housewarming present – among other things), but after I moved it got used outside and all those helpful fuzzy ends wore off. That might be the trick for me. My fingers are crossed. I had a soft flat dust mop thing on a pole that we used to dust our floors. It doesn’t really seem all the necessary here with the kind of wood we have but I may bring it out again and see. Mostly it was necessary for the darker wood since it shows so much dust.B But it was a handy duster! My sister has that same flooring and it is beautiful!!! I was skeptical when she first described it but once it was laid I loved it! I am so excited to see the changes you have coming! I LOVE wood floors and I think this will be so much fun to watch. I really like the white floors also, how neat is that! How exciting, Melissa! I can’t wait to see this finished. I love the hickory. 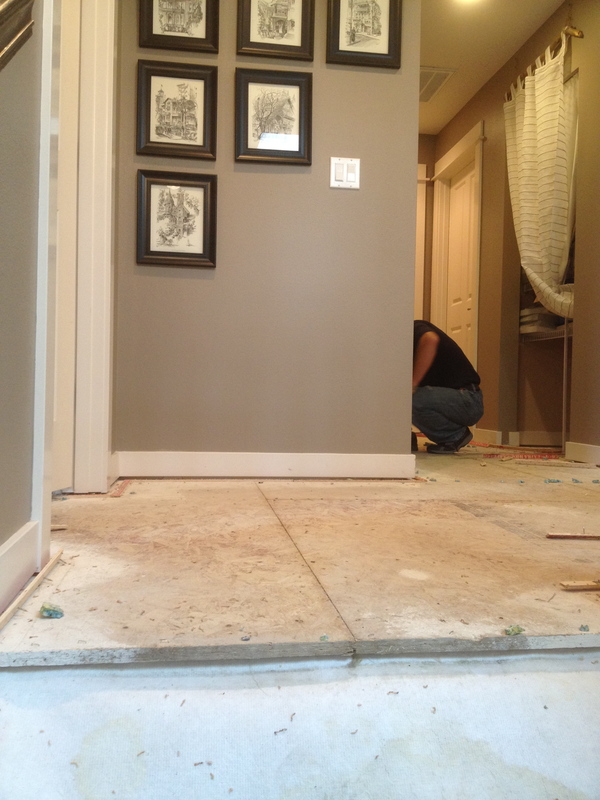 We are planning on putting wood floors in also – hopefully sooner rather than later but we’ll see! We put in laminate floors in our play room on our own and learned our lesson – never again. It’s good to know your DIY limitations. :) It just took us a while – Lowes will be doing our floors next time too! CONGRATULATIONS, Melissa! How exciting. My goodness, what a wonderful change this will be. I’m looking forward to seeing the “after” photos! And thanks for your honesty about the DIY aspect. It doesn’t always pay to do everything yourself, does it? I think you’re smart to give this one to experts! I am going through this whole flooring project too. Still deciding on what product to use…..
How exciting. I’m not a carpet person so laying down hardwood floors is a great thing. I can almost feel your excitement! Nothing transforms a room as much as new flooring, especially the switch from carpet to hardwood. Love the hickory…it’s happily busy pattern makes such a statement. Getting rid of the carpet was agreat idea, some many germs and creepy things thrive in indoor carpet. I recently removed my bedroom carpet and thanks to diy activities I actually did the whole paint on sub floor thing. I thought if I don’t like it I can just floor over it. After lots of prep such as removing the carpet tacking, staples nails, and patching. I used a cream color on the base. Next coat was a dark blue(My country room is decorated in patriotic old time blues and reds)After painting on a small area of blue in sections I used the wood rocker bought at our local craft store and kinda played with it till I got just the right look. Came out beautiful like a blue bamboo wooden floor and it feels cool to walk on also. Lastly a coat of water based polyurathane. Your new flooring is very beautiful. That painted subfloor sounds really cool! You are inspiring me to try it in the other bedrooms! How exciting!! Can’t wait to see what it looks like when it is done! 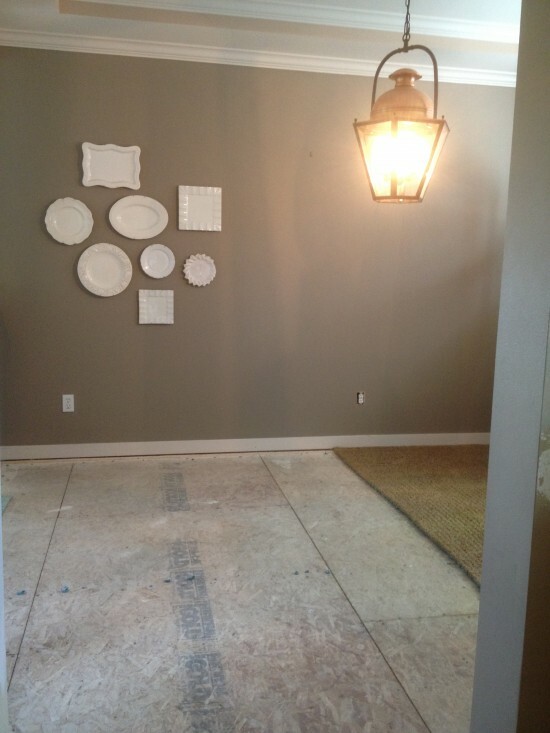 I have been following your remodel blog, and when I saw your carpet ripped out and plywood exposed I just had to laugh because that is exactly how my house looks right this second! I too moved from an older home with hardwood floors to a new home with carpet and was never happy with it. I know the feeling to see that carpet gone and wood floors going down. That hickory is very beautiful. You have done a great job bringing all of your new decor together. Love that farmhouse sink! I am so happy for you. Can’t wait to see the end results! Thanks so much Karon! It is so true, when you’ve enjoyed an older home with hardwoods you can really miss some of those features! I’m excited to have all the benefits of a new house along but be able to add in some of the character of an old house. Have fun with your remodel too!! Your floors are great.. But I admit I am MOST looking forward to how you choose to use/furnish the living room! I am (sorta) patient, so I can wait. In the same stage of our remodel as well and having mahogany interlocking floors done. It sure takes time and lots of $ but cant wait to see the beauty. We have you beat on the carpet…ours was 30 years old and dark forest green (house been a rental for 15 years) Decided not to use Lowes due to the lack of thickness of the flooring…how many layers did your floor have? Looking forward to your finished project. Crazy, long hours at work – sometimes even on the weekends, lack of DIY skill, fear of learning a new DIY skill because i could be biting off more than I could chew, and my own indecision. You certainly struck a chord with me. You are not alone girlfriend! those floors are absolutely gorgeous! And love your staircases! I think carpet should be outlawed! We are in the process of pulling all the carpet out of our house also. Living here in Colorado, people are looking at us like we are crazy. The upkeep is killing me! I was going to put down tile (really, really cold here in Colorado, at that point!) but then I ran across Sarah’s new floor at The Yellow Cape Code and saw her LAMINATE floor! I KNOW! Laminate! I’m placing my order tomorrow!!! BTW, be careful with those stairs if they aren’t finished. During our redo of the stairs, I fell from the sixth step and hit the floor HARD. $1200 worth of dental work later…..
We are 8 months into our remodeling and adding onto a 1900’s farmhouse in Texas. My husband grew up in the house with 10 siblings (he is the baby). And there is a pic with his dad (at a very young age) with his Mom and Dad in front of the house. His Dad was born in 1903 and no longer with us. There is a lot of history in this house. This is going to be our forever home. The long leaf pine floors are being put in as I write this. And we need to make a decision whether to stain them or just seal as is. What are you going to do on your new hickory wood floors? And what do you suggest we do about the floors. Thanks for any insite you can give me. The hallway in white was an interesting canvas – you could try an old fashioned painted tile floor if you do decide to go that route in a bedroom down the road! That was my first thought when I saw that white expanse. LOVE hardwood floors. I get mine before the holidays. I can’t wait to see yours. 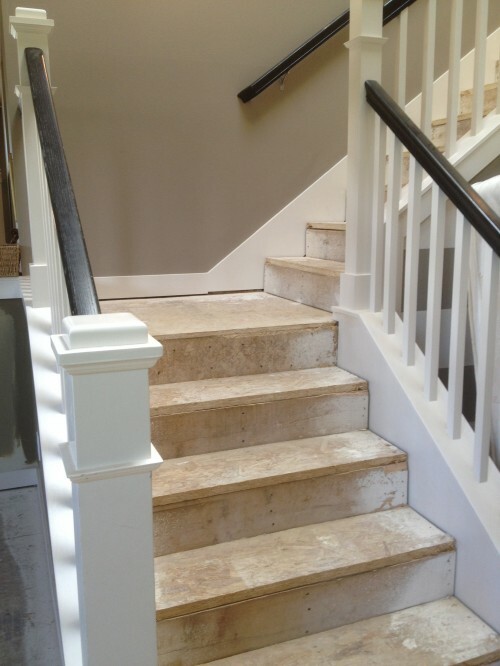 U have inspied me to redo my stairs. Your wall color is studio taupe by behr? Thats what i bought a sample of but it is coming up much darker than expected. Also, aproximately how many sq feet of flooring did you replace and what was the cost for lowes to do it?